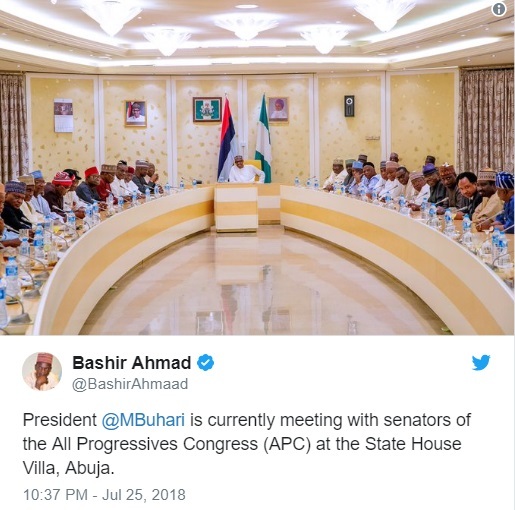 While speaking with State House correspondents after a meeting of Senators of the governing All Progressives Congress (APC), with President Muhamamdu Buhari on Wednesday night, Senate Leader Ahmed Lawan said they went to assure him of their loyalty. According to PREMIUM Times, Lawan also said they told Buhari that some of their colleagues left the ruling party to join various political parties such as PDP, ADC and APGA. He said: “We informed Mr President of how we stand in the Senate. As at today, the Senate APC Caucus is 53 in number followed by the other minority parties. Lawan who spoke on how they assured Buhari that the APC will reclaim the two vacant seats during the bye-election fixed for August 11, also opened up on the 14 senators who left the APC in a mass defection Tuesday. The lawmaker who said the remaining senators are working with the leadership of APC to ensure that those who defected return to the party, added that apart from APC senators, others from the opposition PDP have also indicated their interest to move to the ruling party. Lawan also said they told Buhari of their resolve to work with him to fulfil the campaign promises made by the APC, added that the party campaigned on three core issues including fighting insecurity, revitalising the economy, especially creation of jobs, and fighting corruption. He said the APC government is doing well on those promises. “This administration will end as a very successful one. So far we have done so much with so little in terms of giving development and infrastructure across the country. He said Buhari also assured them of his commitment to work with the National Assembly.